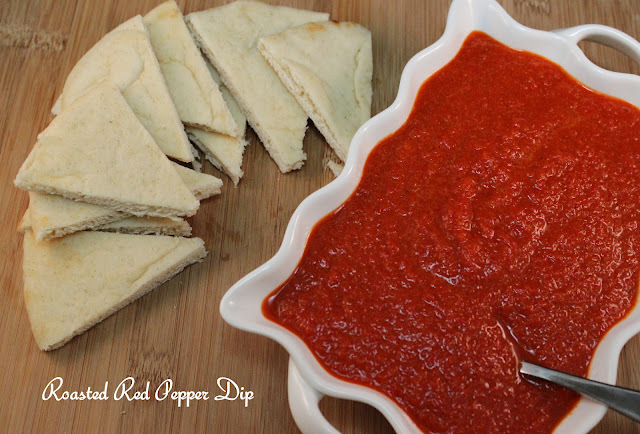 If you like red peppers you will like this dip, if you don't...well try it anyways! It has a clean roasted red pepper taste with just a hint of cayenne. 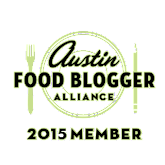 It's a nice change from heavier dips you normally have as appetizers. I made this for my Panini Party and served it with pitas and vegetables. Wash your red peppers (one batch calls for 2 peppers, but I doubled the batch for a party, so my pictures show 4 red peppers). Then cut peppers in half. Remove the insides and seeds. Then place skin side up/cut side down on a foil lined baking sheet. Puree the skinless red peppers with olive, cayenne, balsamic vinegar, garlic, tomato paste, salt and pepper. You can serve this room temperature (immediately after making) or cooled if you make it before hand. Line baking sheet or broiler pan with foil. Preheat broiler. 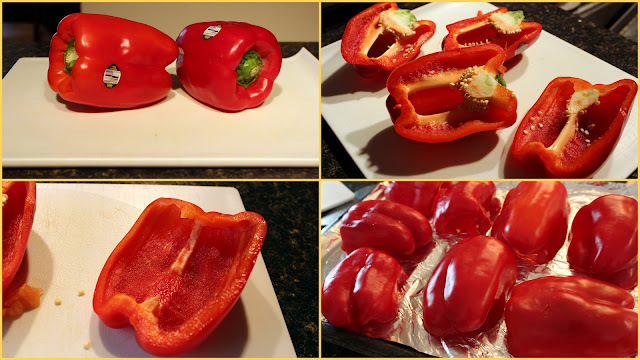 Wash bell peppers and then cut in half, removing all membranes and seeds. Place peppers, cut side down on baking sheet. Broil peppers 5 inches from heat until skin is blackened, about 10 minutes. 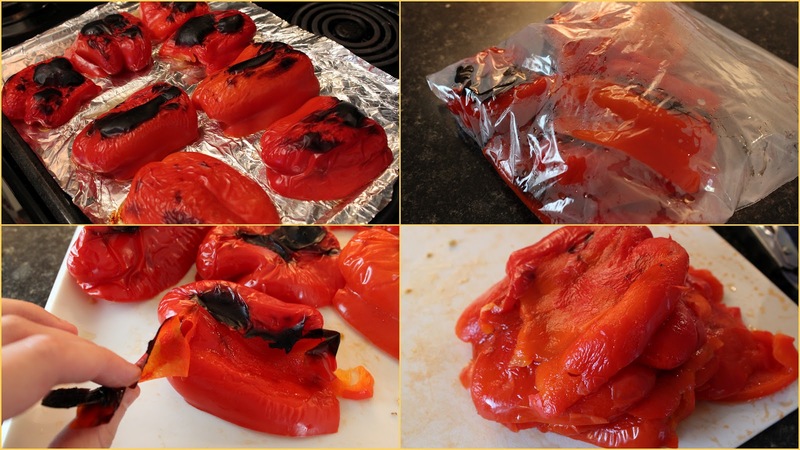 Remove from oven and place peppers in Ziploc bag and seal. Let steam for 10 minutes. Once cool enough to touch, remove peppers from bag and peel off blackened skin. Place peppers in food processor with remaining ingredients. Taste dip and add additional cayenne if desired (I did!) and salt/pepper if desired. 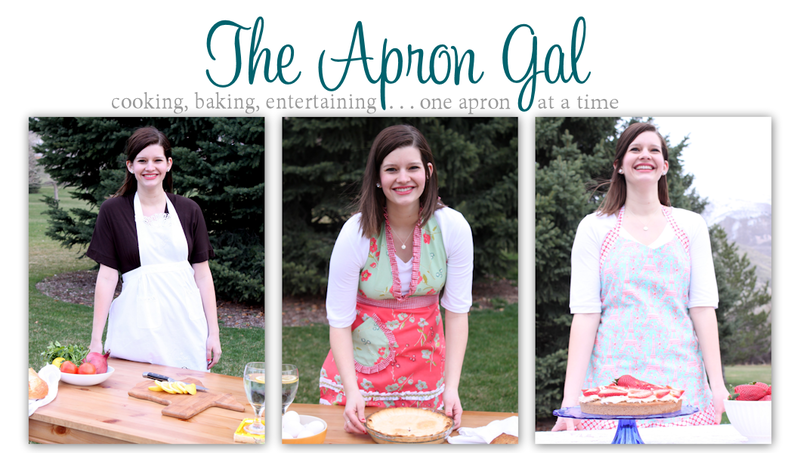 Serve with pita, pita chips or vegetables!